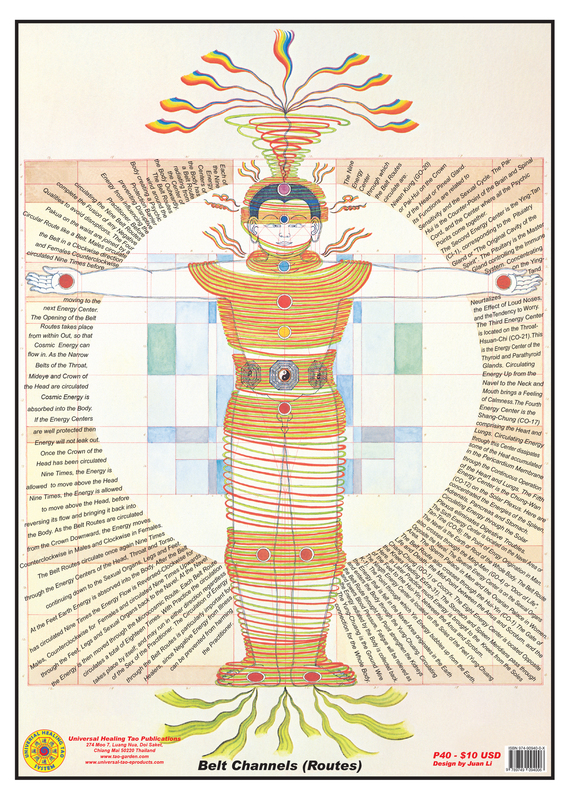 This poster illustrates the Male Body with the Belt Channels (Routes) of Cosmic Fusion with the detail explanation surrounding figure, beautifully illustrated by Universal Healing Tao Senior Instructor Juan Li's original meditative art drawings. After setting up the Energetic Composting Machine and building the Pearl in Fusion I you need to open up channels of the body with Cosmic Fusion (Fusion II) to balance and heal the body. Through the transformation of the internal climate, excess sense energy and negative emotions you need to build the Positive Compassionate Golden Energy (Gentleness/Blue, Kindness/Green, Joy/Red, Fairness/Yellow and Courage/White) and send it through the body by opening up the Creative Cycle (Channel), Thrusting Channels (Left, Center & Right) and Belt Channels (Connecting Heaven and Earth), which are the Basic Fusion II formulas.